Politically speaking, it was a pretty good haul of booty. On June 7, an organization of self-described “pirates” took what was a fairly small step toward gaining real political clout, but a gigantic leap for everyone in the world who has ever downloaded an MP3 file without paying for it. By winning around seven percent of the vote and a seat in the European Parliament, Sweden’s Pirate Party—dedicated to freedom of information on the internet and the abolishment of restrictive copyright laws—did more than demonstrate the power of online rabble-rousing and grassroots net activism; it offered concrete evidence of the viability of a campaign built around the legalization of online file sharing. With the Swedish vote, Western news outlets saw either an example of the growing role of the internet in politics, or a quirky story to throw in at the end of a newscast. But a group of Canadian activists saw something more: an opportunity. “One of my buddies sent me a link on Facebook, and from there I joined up and it just took off,” says 18-year-old Jake Daynes, a Vancouver native who, a few scant weeks after joining, found himself the de facto chief spokesperson for the fledgling Pirate Party of Canada. First it was a few dozen people like Daynes joining a Facebook group, then several dozen more. Then the question went around: “Who wants to make a website?” Next came a message board and chat room on a clunky-looking DIY homepage. Then came a party constitution, a set of bylaws, and some interim party officials. Seven weeks after the official Pirate Party celebrated its victory in Sweden, Canada’s incarnation was closing in on a thousand members in its Facebook group, had a flashier, brand-new website (pirateparty.ca) a communications director hustling for press contacts, was planning its first internal elections, and— maybe, just maybe—looking at some candidates to run in the next federal election. They’ve got a plan: To appeal to their strengths (demographic analysis of ridings that have the highest percentage of under-30 voters), a message to rally the unbelievers (“We point out to older and more Conservative voters that issues like net neutrality and deep packet inspection are very much privacy issues, which is a core Conservative belief,” says Daynes), and a word-of-mouth (or word-of-Facebook) campaign that keeps spreading. A little more than 10 years after university students began whispering amongst themselves about a miraculous new program called Napster, the subterranean rumblings of the Pirate Party of Canada may similarly signify a turning point in the battle for freedom from restrictive copyright law. The Pirate Party of Canada stops short of calling for full legalization of music file sharing, but part of its platform— “We must fight for fair copyright laws. Laws that are fair to consumers, as well as artists … We must also promote and contribute to the sharing of art and culture”—certainly puts it in line with a radical plan for copyright reform that aims to make online peer-to-peer music sharing in Canada completely legal. This plan, conceived by the Songwriters Association of Canada, has been around for two years and has gone through several drafts. Artists would be compensated through a levy charged by internet service providers to all broadband internet users who engage in file sharing (users who didn’t share files could opt out). In exchange for this levy, the user would be free to download as much music as he or she wanted, from as many sites as desired, to keep it for as long as it’s wanted, and to share it with anyone else who paid the levy. The fees would be pooled to create a fund to pay the artists whose music has been downloaded. An industry collective would distribute the money based on data collected by Canadian internet service providers (like Nielsen ratings measure television, only if every television had a Nielsen box). The more an artist’s music was shared, the more she would be paid. The revenues, according to SAC’s calculations, could be substantial. “At $3 a month, when there are 15 million broadband households in Canada, that’s about $500 million per year by 2010,” says Eddie Schwartz, president of SAC. He believes the system would be more equitable for small and independent music acts, allowing them to actually make money from online music even if they lacked the infrastructure the major labels enjoy. “There are musicians out there who, in the world of record labels handling promotion and distribution, have no opportunity for a career in music anymore,” says Schwartz. “The labels are signing very few people and the independent movement has really taken off because there’s so much more talent out there that can’t get signed and promoted. But the independents are being [illegally] file shared as well, so it’s not a career option, really. But if we had a monetization plan for file sharing, those independents would be seeing 100 percent on the dollar, because they’re doing it all themselves. “The existence of free music has helped make the major labels irrelevant. The internet gave artists the power,” says independent singer-songwriter Emm Gryner, herself a member of SAC. “The only problem is, we’re lacking a ‘supervisor’ or ‘boss’ who can look out for songwriters and music-makers as a collective, and make sure we are compensated for our work.” Despite the support of artists like Gryner, the plan wasn’t a big hit when SAC first proposed it in 2007. “Initially it seemed to engender a lot of criticism,” says Michael Geist, the Canada Research Chair in Internet and E-Commerce Law at the University of Ottawa. Subsequent versions of the SAC plan addressed these concerns by making the plan optional for both artists and consumers, thus allowing for compliance to international copyright law, and by leaving it in the hands of the Copyright Board of Canada to set the fees. Studies commissioned by the organization showed that the plan had serious promise, according to Schwartz. “We consulted with creator groups in Europe, in the United States, and with francophone groups in Quebec. We did a lot of research. We had three studies commissioned on international copyright law, an economic study to ensure the numbers were right. We didn’t just jump into this. The Canadian Recording Industry Association ignored requests for comment on the SAC proposal, but has made its dislike of the idea clear. CRIA president Graham Henderson told Reuters early in 2009, shortly after the proposal was released, that his organization wouldn’t be commenting on details of the SAC proposal, telling the news organization that “we don’t want to pursue what amounts to a pipe dream that is presented as a quick fix.” CRIA refused repeated interview requests for this article. The plan faces legal obstacles too. Canada’s copyright laws are currently under reconstruction. The federal government held public forums across the country last summer to prepare to draft and table new legislation, that may or may not include a revival of Bill C-61, which targeted file sharers by introducing a $20,000 fine for uploading copyrighted material. Artist support for file-sharing, however, is less and less a matter of debate. In the past two years, more and more artists have either made their music available via free or pay-what-you-can downloading, essentially taking control of their own online destiny. One of the world’s biggest rock bands, Radiohead, offered up their last album, In Rainbows, as a pay-what-you-want download through their website, released the CD in stores a few weeks later, and still made out like, well, pirates. According to the band’s publisher, Warner Chappell, a year after the album’s fall 2007 release, Radiohead made more money off the pay-what-you-want downloads alone than they made in total from their last album, Hail to the Thief. Other artists have spoken out, in interviews, on their websites, and from the stage at concerts against overly restrictive copyright policies. Nine Inch Nails frontman Trent Reznor famously yelled at fans to “steal, steal, and steal some more” in 2007, and also proposed a levy system similar to the SAC proposal in an interview with tech website CNET. Artists have also formed coalitions to fight for industry reform. Reznor, by the way, flat-out gave away his 2008 album, Ghosts I-IV, on his website. It still ended up at the top of Amazon.com’s list of bestselling albums of that year. Alternative rock legend Billy Bragg penned an editorial in the Guardian in May of this year, on behalf of the Featured Artist Coalition he heads—a U.K.-based artists’ collective of music-industry heavyweights such as Robbie Williams, Radiohead, Annie Lennox, and members of Blur and Pink Floyd. The FAC didn’t call for an end to file sharing, but to embrace it as a distribution medium. When a British ISP owned by Virgin Media planned early in 2009 to launch a subscription-based file-sharing service, its research predicted that 80 percent of music downloaders would be willing to pay for a legal file-sharing method. 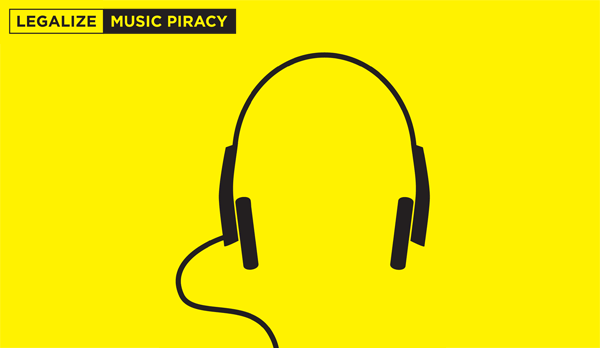 But the project was later scuttled after participating record labels demanded stringent anti-piracy regulations be attached to the service. Scores of popular artists back a file-sharing subscription system and argue against restrictive copyright laws. Consumers say they’re willing to pay for file sharing. Political parties that support less restrictive copyright laws are gathering steam and Canada’s government spent the summer asking the public for guidance on the topic. A proposal that would legalize file sharing, compensate the artist, and move the music industry forward—and away from a battle that was lost more than a decade ago—has spent two years under construction. And yet the average music fan still wonders what will happen if he gets caught downloading the latest Tragically Hip album and worries about a $20,000 fine for uploading music if Bill C-61 is eventually passed. Why? The last roadblock to the future of music distribution is the same as it was more than 10 years ago: the music business itself. Legalizing file sharing is the musical equivalent of legalizing prostitution: it’s already happening, crackdowns don’t stop it, and there are existing commercial frameworks that would improve working conditions and curtail exploitation. The only things standing in the way—in both cases—are the taboo (it’s still illegal, after all) and the middlemen, those who stand to lose millions of dollars if the workers are allowed to own the means of production. The technology isn’t disappearing. The lawsuits aren’t working. Public support for a better way is only increasing. It’s time to legalize online music sharing.